The Great American Road Trip 2008 - Enter our Contest and Win Prizes! 1. Eligibility: Sister Betty's Great American Road Trip 2008 Contest is open to any person of at least 18 years of age residing in jurisdictions where such contests are legal and who meet the criteria of the contest as outlined below. By participating, you agree to all the rules and decisions of Sister Betty, which are final and binding, in all matters pertinent to the contest. 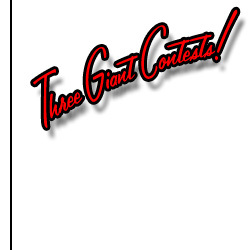 Contest begins August 1, 2008, and ends December 31, 2008. 2. Email List Contest: Sister Betty will award one (1) iPod Nano or similar device to one subscriber of Sister Betty's Email List selected at random. To be eligible for this contest, you must be subscribed to the email list at least 14 days before the drawing with a valid email address. Sister Betty will pay for shipping within the 50 United States. Winners outside the United States must pay any shipping costs. 3. Tell Us Where To Go Contest: Sister Betty will award one (1) $50 (fifty dollar) Visa Gift Card or check to one person as chosen by Sister Betty and Burqa Boy. To enter this contest, you must submit your name, a valid email address, and a suggestion where Sister Betty and Burqa Boy should stay or visit on Road Trip 2008. The best suggestion, judged soley by Sister Betty and Burqa Boy, will win the prize. You may enter up to three times per day. 4. Link to Us Contest: Sister Betty will award $100 (one hundred dollars) to one person, selected at random, from all the entrants to this contest. To participate, you must link to Sister Betty's Great American Road Trip 2008 using this URL: http://www.sisterbetty.org/roadtrip2008/index.htm. You must submit your name, valid address, and link URL to Sister Betty at least 14 days before the drawing. Links must remain valid throughout Road Trip 2008. Sister Betty may reject any submission that does not contain a valid link, where such links violate legal or posting restrictions, where links are removed before the end of Road Trip 2008 or where links are too obscure to be reasonably accessible to website visitors. 5. Notification: Sister Betty will attempt to notify the winner of each contest via email immediately after the contest decision or drawing. The winner must respond to the email within 4 business days to claim the prize. Prizes unclaimed after 4 (four) business days will be awarded to a second place winner. In the event a second place winner does not claim the prize within 4 (four) days, the prize will be void. 6. Taxes: Winners of each prize are solely responsible for any taxes due. 7. Legal Stuff: Decisions regarding eligibility, awards, winners will be made solely by Sister Betty. By participating in these contests, participants agree such participation is strictly voluntary and agree to abide by Sister Betty's decisions and hold harmless Sister Betty, her affiliates, friends, other nuns, convents and pets. Participants agree to bring no legal action and set aside all legal remedies arising from participation in said contests. 8. Publicity: Winning participants in any contest may have their name and location posted on SisterBetty.org. Email addresses for participants will not be posted.